Peg Perego RIALTO Booster High Chair - Free Shipping! The booster chair that is easy to open, close and carry anywhere, thanks to a handy carry bag. Ideal on journeys and outings. Rialto can be height-adjusted with ease to accommodate for the child's growth. Removable, folding tray. 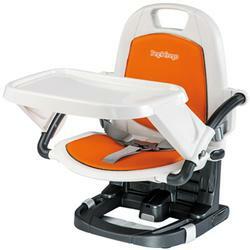 The booster chair that is easy to open, close and carry anywhere, thanks to a handy carry bag. Ideal on journeys and outings. Rialto can be height-adjusted with ease to accommodate for the childs growth. Removable, folding tray.